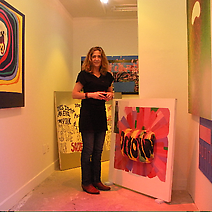 Rochelle Feinstein lives and works in New York. She has exhibited her works nationally and internationally and has been a professor of painting at the School of Art, Yale University, since 1995. A painter, she has also been known to work across varied media, yet from the attitudes, motifs and conventions that are embedded in painting. Recently, Feinstein had solo exhibitions at Momenta Art (Bklyn, NY), and The Surburban (Chicago) in 2008, Ten in One Gallery, 2002, Max Protetch Gallery, 1997, Bill Maynes Gallery, 1996, in New York, among many others. Her work has been reviewed in Artforum, TimeOut, The Village Voice, Tema Celeste, Artnews, Art in America, BOMB, The Paris Review, The New York Times, The New Yorker Magazine, and other publications.